Spread the word! 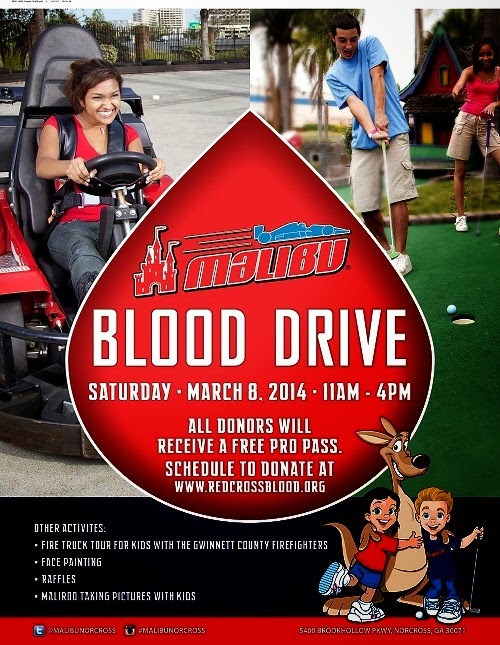 Malibu Grand Prix and the American Red Cross are hosting their 1st annual Blood Drive on March 8th from 11am to 4pm. You can help either by being a donor or letting friends and family know about our blood drive. All participating donors will receive a free “All day pass” along with other incentives from local business! Come meet Gwinnett County Fire Fighters with tours to the Fire truck for Kids! Please schedule an appointment, go to redcrossblood.org and enter sponsor code: malibu. You may contact Christian Hernandez at Christian.Hernandez@PalaceEntertainment.com with questions or help with scheduling.